A hope-filled expository guide to an epistle written to Christians in a society like ours. A must-read for Christians under cultural pressure. The book of 1 Peter could have been written for our times—a time of antagonism toward biblical ethics, and the marginalization of biblical Christians. Into that culture—our culture—Peter speaks of hope and offers joy as he points believers home to heaven. 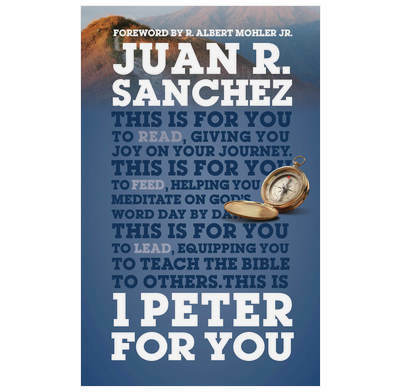 Juan Sanchez brings his experience of ministry in the US and Latin America, and his pastoral wisdom and insight, to this wonderful epistle—an epistle that every Christian needs to treasure today. We used this for our Small Group leaders to prepare in leading their groups through a series on 1st Peter. Like the others books I've used in this series, I found it to be practical, easy to read and full of useful insights and challenges. Yes it is slightly repetitive on the theme of suffering for your faith, but to be fair 1st Peter emphasises this theme repeatedly so I think it is pretty true to the text. If you want to gain an excellent understanding of 1 Peter in an easily readable format then this book is for you. It is the first book I have read by Juan Sanchez and I must say I was taken aback by his clarity, contextual understanding and warmth and relevance of application. He also has a wonderful command of the written word. I have studied 1 Peter several times but found this book full of fresh and accurate insights, as Juan Sanchez related the text to the overall context of the book and the situation of its original audience. I would highly recommend this as a helpful resource for anyone wanting to study 1 Peter and look forward to his next offering!